During 2017’s bull market, DASH was one of the biggest winners among all cryptocurrencies. The coin started the year with a little over $11 and ended the year with $1,051 on December 31, 2017. The largest bull run of the cryptocurrency was between November 4 and December 21, 2017, when DASH increased its value from $273 to nearly $1,600 in less than two months. Created from the Bitcoin protocol, Dash (DASH) is a privacy-focused cryptocurrency as well as a decentralized autonomous organization (DAO), which is run by the users. Dash users operate special servers called Masternodes that are responsible for a significant percentage of the cryptocurrency’s infrastructure. In addition to contributing to the infrastructure of the network, Masternodes provide additional features to Dash. These include the cryptocurrency’s instant (InstantX) and private transactions (Darksend). Users can set whether they want to use the aforementioned features when sending a DASH transaction. The Dash Foundation – the non-profit with the goal to promote, standardize, and protect DASH along with other privacy-focused cryptocurrencies – had generated multiple good Dash news in the past years. One great example of that is the Dash Foundation’s work in Venezuela to provide an alternative currency for the citizens who are in the midst of a financial crisis. Dash was created in January 2014 (dubbed as “Xcoin” at the time). Since then, the cryptocurrency has made quite a name for itself. Therefore, many DASH exchanges and brokers are offering trading services for the coin. This is good Dash news but makes it harder for the average user to determine where to buy Dash. But, hey! That’s why we are here. We have tested numerous services – including cryptocurrency exchanges and brokers -, analyzed these services thoroughly, chose the best ones, and ranked them. Furthermore, we have included a step-by-step guide on how to buy DASH one each and every service. So, after reading this article, you’ll not only know which platforms are the best Dash converters, but you’ll also learn to use the services to buy DASH. But let’s not jump in the middle of all that – let’s see first the main differences between buying and trading the cryptocurrency. Now you know the upsides and the downsides of having a crypto wallet to store your coins. You may have decided to create one, so we are here to show you how to create a Dash wallet. Furthermore, we have selected one of the best solutions for that. Let’s see! So, the Dash wallet we are recommending for you is the Infinito Wallet. What’s so special about this mobile-based service is that it supports over a 1,000 of coins, including DASH. In addition to that, Infinito is secure as well as it has a nice, user-friendly design. Infinito supports both Android and iOS. So, to get started head to the App Store or Google Play to download and install the application, then create your Dash wallet. You can also download the app using the links on the official website of the service. eToro has been rated as the best social trading platform by the reputable website Brokerchooser. It’s not just the best social trading service, but we also believe it’s the best platform for buying DASH. The Cyprus-based broker has been on the market for over 12 years, providing a trusted and regulated service to its customers. Regulated in multiple countries – including top-tier regulators, such as the UK’s FCA -, eToro features an easy-to-use platform, fast registration, and great service overall. For a time, eToro offered cryptocurrency trading as CFDs. However, that changed in March 2018, when the broker announced that users of the website could buy cryptocurrencies outright. This means that you actually own the DASH you purchase on the platform. However, the coin is stored in crypto wallets. As eToro is regulated in several countries and has a long history of operating as a trusted broker, you don’t have to worry much about your coins’ safety. Now, it’s time to see our step-by-step guide on how to buy Dash on eToro! Navigate to the website of the service and click the green “Sign Up” button in the top right corner of the page. Fill out the form with your name, username, email, phone number, and your desired password. 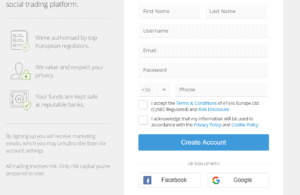 Be sure to accept eToro’s terms before proceeding to create your account. You can use your Google+ or Facebook account to register faster. Before you can start trading on eToro, you have to verify your identity and your residence. Take a clear photo or scan your documents (check the broker’s website to see which type of documents they accept) and send them to eToro. You also have to fill out a questionnaire that tests your trading skills and experience as well as warns about the risks associated with trading assets on the platform. After your account is verified, you’ll have to deposit funds. 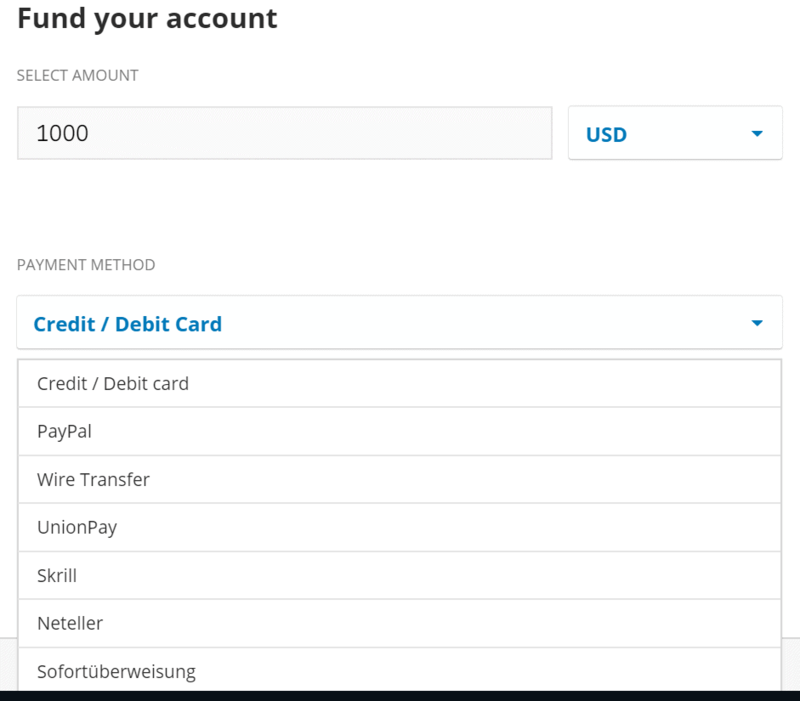 eToro accepts PayPal, credit and debit cards, Neteller, Skrill, bank transfers, along with other payment methods. The good news is that deposits are free of charge on the broker’s platform. After selecting your preferred payment method and filling out the details, select the amount of funds you want to deposits, and proceed to the next step. As soon as your funds are credited on your account, you can start trading. Use the search bar on the top of the page to search for Dash (DASH). The page will take you to the DASH to USD trading pair. Check the Dash rate and select the amount of coins you want to buy. Execute the trade. Binance is a cryptocurrency exchange that is favored by many users on the Dash market. The platform launched in 2017 and soon climbed up the ladder to be a top Dash exchange. Unlike at most brokers, you don’t need to verify your account on Binance if you are trading normal amount of coins. The DASH exchange features a wide variety of cryptocurrencies with exclusive crypto-to-crypto trading. Since you don’t need to verify your account to buy DASH (normal amounts), we’ve left out the verification step from our step-by-step guide. We’ve replaced that with setting up 2-factor authentication (2FA), which is important for your cryptos’ security. Let’s dive in! 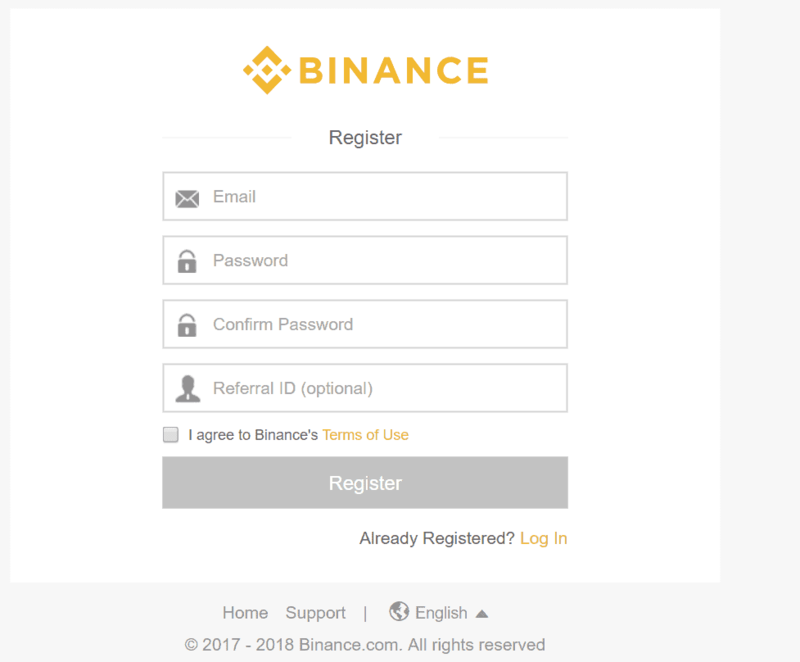 When you are on the Binance website, click “Register” in the top right corner of the page. You only need an email and a strong, but memorable password to register an account on the DASH exchange. Agree to Binance’s terms and proceed with creating your exchange account. Don’t forget to check your inbox to verify your email thereafter. As Binance is a cryptocurrency exchange, you own the DASH you buy on the service. Therefore, you need a wallet for that (which is provided by Binance). Since cryptocurrency exchanges are often targeted by attackers, you need to take an extra step to protect your coins in case the hackers succeed. We recommend you to set up 2-factor authentication for that. 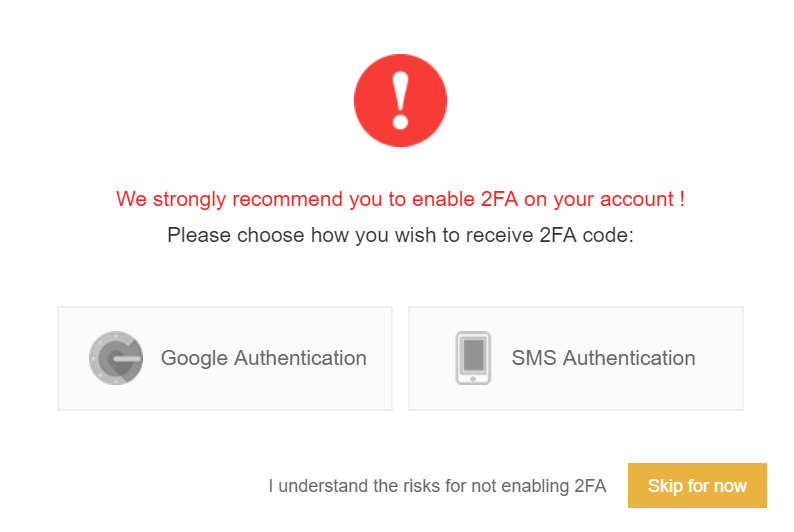 If you set up 2FA, your Binance account will ask you to type in a code you receive on another device to the exchange platform every time you try to log into your account. That will allow better protection against attackers as they need to acquire your code sent to your device in addition to your login credentials to steal your funds. You can use either your phone number or Google Authenticator to set up 2FA. In case you use your phone number, you’ll get a text message every time you try to log in. If you choose Google Authenticator, you’ll have to download the app on your smartphone (it’s available for both iOS and Android). After you sync it with your Binance account (by scanning the QR code on the website), you’ll be able to type in the code to the appropriate fields using the application. Choose either of the options above, and proceed to the next step. If 2FA is enabled on your account, you can start depositing funds to your account. Please note that Binance accepts crypto deposits only, so you can only fund your account with cryptocurrencies. Furthermore, the Dash exchange has four base currencies: BNB, ETH, BTC, and USDT (as well as other stablecoins). So, if you want to leave out a step from the buying process, make sure you deposit funds into your account in one of the aforementioned base currencies. If you choose to deposit a cryptocurrency other than the four base currencies, it’s not a big problem. 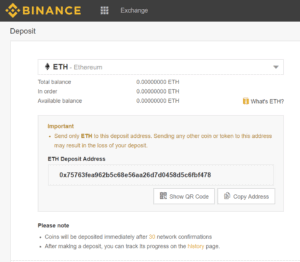 When your funds arrive into your account, use Binance to convert them to one of the base currencies before buying DASH. Now, head to the “Deposits” tab (in the “Funds” menu) of the DASH exchange. If you are there, select the coin you want to use to fund your account. The page will show a wallet address where you should send the cryptocurrency to. If you are using a mobile wallet, scan the QR code of the wallet or copy-paste the wallet address to your wallet (in case you are on desktop). Then select the amount of crypto you want to send and execute the transaction. If your funds have arrived into your account (it shouldn’t take longer than 1-2 hours), it’s time to buy Dash. Head to the “Exchange” tab on Binance and select from either the basic or advanced trade views. Choose the base currency you want to use for trading and search for DASH. Clicking on the currency pair (e.g., BTC/DASH) will take you to the trading page. You’ll see a chart, showing you the DASH exchange rate as well as the past prices of the coin. On the bottom of the page, you’ll see three different options for trading. The first one is the limit order, where you can set your own DASH rate. The platform will only execute the trade at the Dash price you provided. The market order is the fastest one as it uses the Dash market rate to execute your order. While limit orders can be slower to execute, the DASH rate is often better than at market orders. The third option, the stop-limit order, is used mainly for short-term trades to minimize losses when the Dash price reaches a specific target – the trade will execute automatically in that case. Select your desired order type, the amount of DASH you want to buy, and proceed with executing the trade. The San Francisco-based cryptocurrency exchange Coinbase is one of the largest players in the crypto space. Furthermore, Coinbase is one of the most newbie and user-friendly crypto exchanges – they made the buying process as easy as possible for their users. However, as the service has a “Pro” platform, it is also best suited for experienced digital currency traders and investors. Coinbase features two payment methods; bank transfers and credit card transactions. If you are purchasing a coin from service, we would recommend you to use either a credit or debit card as the processing fee is one of the lowest on the market (1.5%). However, one big downside of Coinbase is its limited support for digital currencies. And, unfortunately, Dash is not among the handful of coins that the cryptocurrency exchange allows users to trade. Changelly is a near-instant cryptocurrency exchange where transactions take between 10 to 30 minutes to arrive. You don’t even need to deposit funds to your account as the DASH exchange deducts the funds from either your cryptocurrency wallet or your credit card and credits it directly to your DASH crypto wallet. While Changelly is quite fast, credit card transfers are expensive (the exchange and its payment processor take almost 10% from each transaction). Great Dash news ahead! In addition to not requiring deposits – in case you are trading normal amounts of funds -, you don’t need to verify your account at Changelly. Now, let’s see how to buy DASH on the cryptocurrency exchange! Changelly asks you only minimal personal information from you: your email address. Head to the website of the DASH exchange and click “Sign Up” on the top right corner of the page, type in your email and create your account. You can also use Google+, Facebook, and Twitter to register an account at Changelly. After your account is created, check your inbox for an email from Changelly. If you don’t find the message, check your spam folder (and promotions if you are using Gmail). You’ll find a link inside the email. Click on it to verify your email address. Like Binance, Changelly is a cryptocurrency exchange where you need a wallet to store your funds. To protect your crypto, you need to set up 2FA here too. For Changelly, you can use Google Authenticator. Use the Android or iOS link found in the 2FA section in your account to download the app. Sync it with Changelly, and proceed to the next step. On the homepage of the service, select the currency you want to use to buy DASH. Then choose Dash from the dropdown menu below. Select the amount of Dash you want to purchase and proceed with typing in your credit card details. Execute the trade. Your funds are expected to arrive between 10 and 30 minutes. CEX.IO is a cryptocurrency exchange with a long history. 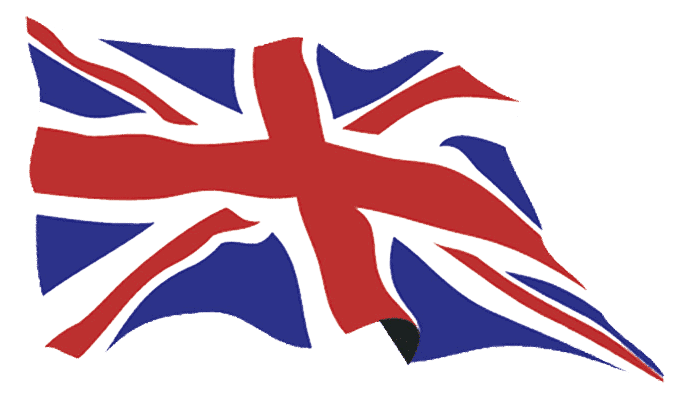 Headquartered in London, the United Kingdom, the service was founded in 2013. The company operating the exchange had another service at the time, which was one of the largest mining pools in the Bitcoin network at a certain point in time. While CEX has reasonable rates on the DASH market for credit card purchases (2.99%), some users stated that the platform has some hidden fees that add up to 5% for each transaction (totaling almost 8% of fees for each credit card transaction). Unlike Binance and Changelly, CEX.IO requires you to verify your identity before you can start trading on the platform. 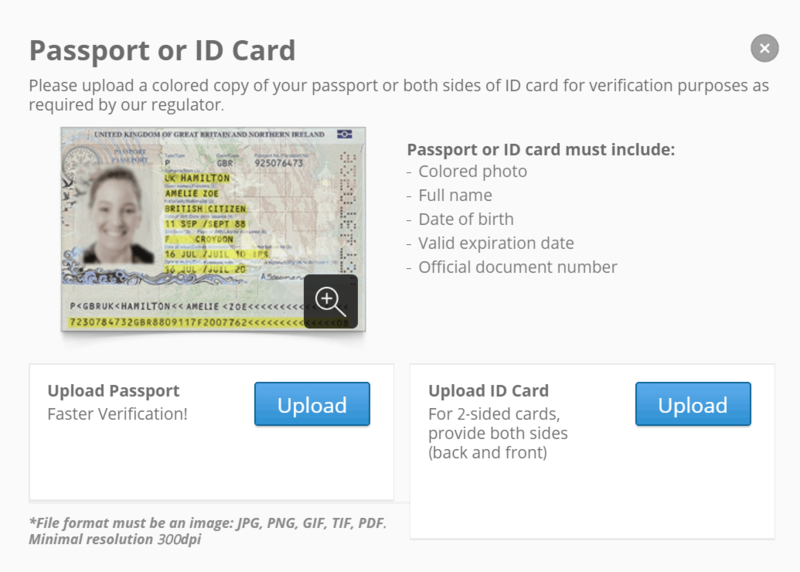 The verification step could be a bit tricky, but the images you send are clear, the verification process is quite fast. When you are on the homepage of the platform, click on the “Register” button to create your account. You can either register with an email and password combination or use an external service. CEX accepts Telegram, Facebook, Google+, VK, and GitHub for registering. Telegram can also be used for verifying your account. Choose one of the options listed and proceed to the next step. Now, here comes the tricky part. However, if you do everything right, your account is verified quickly. When we registered an account on the service, we used Google+ first. For verification, you should download the CEX app. However, we were unable to log in via Google+ in the mobile app, so we went with creating another account with email. CEX will ask you for a proof of identity. 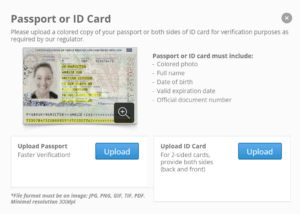 You have to take a clear photo of your passport, government ID, or driver’s license. The next step is to find a piece of paper and write a note stating that you’re a CEX.IO customer. Finally, hold the note and your document in your hands and take a selfie (this is the tricky part). After you have successfully verified your account, you can deposit funds into your account. CEX accepts credit cards, bank transfers, and CryptoCapital for adding funds. Head to the “Deposit” tab, select your preferred payment method, the amount you want to send, and execute the transaction. If your funds have arrived into your account, it’s time to buy some DASH on CEX. Navigate to the “Trade” tab and choose the DASH/USD pair. To exchange DASH to USD, select the amount of Dash you want to purchase. Similarly to Binance, you’ll see different order types. We’ve already explained limit and market orders. The new one is margin trading, which uses loans on the platform to trade larger amounts of funds. While the profit margin is higher during margin trading, this order type is much more riskier than the others. Only choose this option if you have solid experience trading cryptocurrencies. If you have selected your order type, choose the amount of DASH you want to buy, and execute the trade. Plus500 is an Israel-based broker with over ten years of operating experience. The broker features mostly CFD trading for different assets, including stocks, forex, and cryptocurrencies. As coins are traded via CFDs on the platform, you don’t have to worry about that they are stored in cryptocurrency wallets. On the flip side, you do not actually own the digital currency you are trading on the platform. Plus500 is regulated in multiple countries – including top-tier regulators like the UK’s FCA -, and it is publicly traded on the main market of the London Stock Exchange. Therefore, the broker has to comply with additional laws as well as regulations, which may result in added transparency and security for Plus500 users. Although, Plus500 provides bad news for Dash as the cryptocurrency is not traded on the broker’s platform. Therefore, you have to choose another service to buy the coin. We’ll advise you to pick one of the services we are recommending in this article (we ranked eToro as the best Dash exchange). The citizens of the United Kingdom are increasingly interested in cryptocurrencies, including Dash. The continent the country is located at, Europe, is the second biggest hub for blockchain and digital currency-related services. However, due to such a vast number of cryptocurrency exchanges and brokers, it can sometimes become hard and tiring to select the best service for UK citizens. But worry no more. We are here to help you with that. We’ve selected eToro as the best service for UK citizens as it has cool social trading features, an easy to use as well as newbie-friendly platform, fast account creation process, and multiple payment methods (including PayPal and credit cards), which you can choose from to deposit funds into your account. Moreover, the broker is regulated in the United Kingdom via the FCA, so this adds additional protection for the citizens of the European country. North America is the top continent for cryptocurrency and blockchain-related services. Therefore, the citizens of the USA and Canada are highly interested in digital currencies, such as Dash. However, the strict regulations of both countries have made a part of the cryptocurrency exchanges and brokers to deny or restrict their services for US locals and Canadians. Therefore, it can become hard to select the best Dash exchange for the citizens of the aforementioned countries. Let us spare your time as we already know the essential service to use for buying Dash in the USA and Canada. And this service is Changelly. If you are from the USA or Canada, you don’t have to worry about the geographical restrictions of the service as the cryptocurrency exchange accepts users from all over the world, without exception. Furthermore, Changelly features near-instant transactions that will take a maximum of 30 minutes to arrive (coins are usually credited into your wallet faster than that). To see the exact steps on how to buy Dash on Changelly, read back to find our tutorial on the topic. While North America and Europe are favored continents of cryptocurrency services, Australians also have a passion for blockchain tech and coins like Dash. However, most cryptocurrency exchanges and brokers are mainly focused on the aforementioned continents, but not the Oceanic country. So, we are here to help you in choosing the best service to buy Dash in Australia. Similarly to Changelly, Binance has no strict rules for the geographical location of its users. 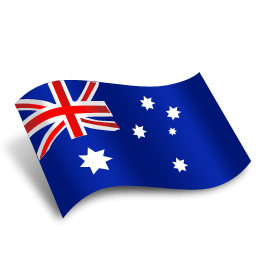 Therefore, it is best suited for users from all around the world, including Australians. Binance features a wide variety of coins, four base currencies (BTC, ETH, BNB, and stablecoins), relatively low trading fees as well as high initial account limits. To learn more about how to buy Dash on Binance, read back to the section of this article where we have compiled our step-by-step tutorial for using the cryptocurrency exchange. We’ve mentioned that – unlike “manual” or traditional trading – you don’t need any trading experience or knowledge to trade Dash on most crypto robot platforms. These services utilize bots that are based on algorithms to scour the cryptocurrency market, looking to take advantage of the relatively high volatility of digital currencies and to make potential profits fully automatically. Therefore, the main benefit of using a trading robot over the manual trading method is time efficiency. If you are using the traditional method, you need to sit in front of your computer all day, monitoring the price charts, and deploying both fundamental and technical analysis. On the other hand, you’ll only need to register an account at an automated cryptocurrency trading platform, deposit funds into your account, then set up your bots to do all the trading for you. The only thing you have to do thereafter is to monitor the performance of your Dash robots. Furthermore, most of the algorithmic crypto trading platforms have their owns strategies and indicators – that are already programmed into the robots -, so you’ll need absolutely no trading as well as programming knowledge and experience. If you are interested in trading Dash with a trading robot, then check out this page we have created on automated cryptocurrency trading along with the best solutions for this method. You own DASH, you have the right to move it, sell it, and transfer it as you wish. Credit cards offer quick, convenient, and almost instant transactions when you are buying cryptocurrencies. However, these type of transactions almost always cost more than bank transfers. Moreover, not all of the providers offer credit card payments. Considering Dash, the cheapest way to buy the cryptocurrency with a credit card is at brokers. Unlike most of the brokers, eToro offers outright DASH trading, meaning that you own the coins you buy at the exchange. Moreover, credit card transactions at eToro won’t even cost you a penny as deposits at the broker are free. To buy Dash with a credit card at eToro, deposit funds into your account using a credit card, then head over to the trading tab to purchase DASH. PayPal is one of the most popular payment services on the globe. The service is trusted by millions of customers all over the world due to PayPal security and convenience. PayPal maintains its tight security by strict rules, which include denying cryptocurrency and crypto-related transfers. Therefore, you can’t buy Dash with PayPal directly. However, there’s a workaround that lets you convert Dash to PayPal indirectly. 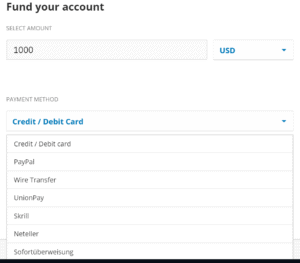 Brokers, such as eToro, that support crypto trading accept often accept PayPal deposits (eToro does). Just create and verify your account, deposit funds via PayPal, and use that to buy Dash. When you have some BTC in your crypto wallet, it is more convenient to exchange it to Dash instead of using a fiat currency to buy the coin. In that case, you would have to convert your BTC to fiat, withdraw your funds, then deposit funds into your account to purchase DASH. On the other hand, if you directly buy Dash with your Bitcoin balance, you only need one or two steps for the process (two steps are only needed when your BTC is held in your exchange wallets or on your brokerage account). So then, let’s see how can you buy Dash with Bitcoin with us showing you the best exchange to do that. We’ve chosen Binance for this short guide as the cryptocurrency exchange features relatively low trading fees, a wide variety of digital currencies – including four base currencies (BTC, ETH, BNB, and stablecoins) – as well as high initial account limits. To buy Dash with Bitcoin, first create an account on the service, then set up 2FA to protect your funds. 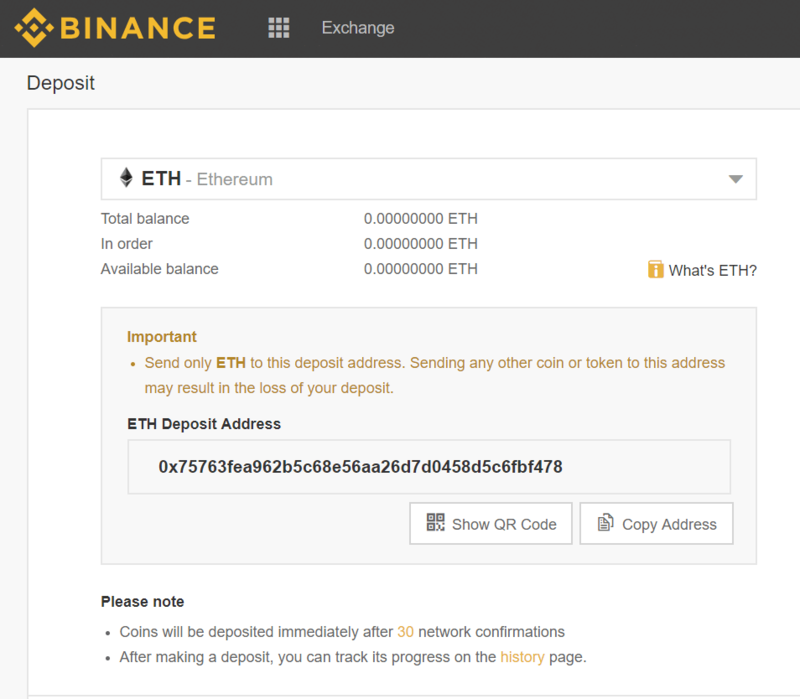 The next step is to navigate to the deposits section where a Bitcoin address will be shown, which you have to use to deposit BTC into your Binance wallets. After you have initiated the transaction, your coins will show on your account in a maximum of 2-3 hours. When your funds are ready, head to the trading page and choose BTC as the base currency. Select the Dash/BTC trading pair, the amount of coins you want to exchange as well as your preferred order type, then execute the trade. After a time, when your coins have risen so much, you may want to sell them to make some profits on your investment. In other, less fortunate cases, you seek to sell your digital currencies to minimize your losses. The same can happen with Dash, so we are here to show you briefly how you can sell Dash on one of our top-rated cryptocurrency exchanges, Binance. The first step is to create an account at the service. After you are ready with that, you need to set up 2FA. The next step is deposit Dash into your account using the wallet address shown in the deposits section of the platform. After your coins have arrived, head to the trading page and select from the four base currencies as well as a Dash trading pair for that. When you are satisfied with the current rates, select the amount of DASH you want to sell as well as your preferred order type, and finish the process by executing the trade. Now you know the best services where you can buy Dash. You also possess knowledge about how you can use these services as well as different payment methods (credit card, PayPal) to purchase the coin. And you learned the difference between buying crypto CFDs and trading while owning the coins in a wallet. After analyzing numerous service providers, we chose to make eToro as the winner here. With a reputable history, eToro provides a great experience for its users, including cool social trading features, fast and account creation, as well as a nicely-designed mobile trading app. Bitcoin vs Dash: what’s the difference? Both Bitcoin and Dash are cryptocurrencies, but they are pretty different. So, let’s see our Bitcoin vs Dash comparison with first starting with Bitcoin. Bitcoin is the brainchild of the anonymous Satoshi Nakamoto who created Bitcoin in 2009. The goal of the cryptocurrency is a decentralized peer-to-peer network where the participants are able to send funds to each other using only wallet addresses and their private keys without any geographical restrictions. Unlike corporate companies that are operating electronic payment systems, Bitcoin is not using central servers. Instead, miners are maintaining the network, processing transactions, and supporting the ecosystem in exchange for transaction fees and block rewards. As over a million computers are supporting the Bitcoin network, this creates an added security as well as transparency for the cryptocurrency’s blockchain. However, Bitcoin has different limitations. Firstly, there have been issues with the cryptocurrency’s scaling as the number of transactions that can be processed in a second has a cap, the block size limit. Bitcoin developers try to solve this issue by implementing off-chain transactions via the Lightning Network. However, the development of that system is still not complete. Therefore, in case of network congestion, transaction processing times can become slow and the cost of the transfers expensive. Furthermore, Bitcoin transactions are not private. While BTC transfers are pseudonymous, they can be easily traced back. And finally, the digital currency’s funding model is inefficient as it is managed by volunteers and powerful interest groups. The privacy-focused coin Dash seeks to solve all the aforementioned issues of Bitcoin. Dash features the concept of Masternodes to incentivize the users with payments to provide security to the network as well as to introduce additional features to the blockchain (we’ll talk about these a bit later). The operators of the Masternodes have to invest a certain amount of Dash. For exchange, they will receive a percentage of new DASH blocks that have been mined. So, about the additional features we promised to mention later, here they are. The first one is PrivateSend that allows Dash users to send anonymous transactions to each other, which are much harder to trace back than BTC transfers. Furthermore, the InstantSend feature allows network participants to send DASH transactions that are confirmed within seconds. Compared to Bitcoin’s average of one hour (six confirmations), InstantSend Dash transactions can be considered as super fast. Dash has a self-sustainable decentralized governance. In addition to being incentivized, one Masternode has one vote in the network. Furthermore, the Dash blockchain is self-funded with a portion of each block allocated to the Network Development and Promotion Budget, meaning that the developers and promoters of the cryptocurrency receive payments for their contributions as opposed to the Bitcoin network. Dash uses Masternodes that facilitate the anonymous – PrivateSend – transactions in the network. When you choose to use the PrivateSend feature, the network will mix your coins before sending out the transfer to the recipient. The whole mixing process is done for the users, depositing their DASH in new addresses. The final result of the process will be coins with obfuscated origins. On the flip side, transactions in the Dash network are only anonymous when you are using the PrivateSend feature. The main criticism coming from this is that the Dash network is not anonymous at all in case users are not turning on PrivateSend. If a user is not turning on that function when sending you coins, there’s a chance the DASH you receive could be traced back by others. What’s the most secure Dash wallet? Keeping your Dash secure is crucial when you are using a cryptocurrency wallet. Therefore, you have to select a service that will keep your coins safe. As hackers are highly targeting the crypto space, you need to prioritize security when it comes to the storage of your DASH. Now, let’s start our journey on finding the most secure wallet solution for the privacy-focused digital currency. Experts consider hardware wallets as the most secure services for storing cryptocurrencies, including Dash. These wallets come with a physical device, which you have to use to type in a PIN every time you try to log into your wallet, or you send an outgoing transaction. Do you see the added security here? If not, let us explain. So, a hacker tries to steal your funds from your hardware wallet. Let’s say that he has managed to breach the software side of the service. In addition to doing that, he has to acquire your physical device as well as your PIN, which he has to type in to steal your coins successfully. It seems hard, isn’t it? We haven’t heard of a single case when somebody has successfully conducted such an action. But in case an attacker succeeds with that, he has to be a mastermind hacker. We recommend using trusted hardware wallet brands, such as Ledger, Trezor, and KeepKey. All of these providers are highly praised in the cryptocurrency space, and their devices are offering storage for numerous coins, including Dash. However, if you want to stay with a software wallet, the mobile-based multi-coin Infinito Wallet is a great service you can trust. What’s your Dash price prediction for 2019? Honestly, we don’t have a Dash price prediction for 2019. And we believe that no one can provide you with an accurate answer to this question. The reason for that is the fact that cryptocurrencies like Dash can sometimes become highly volatile. In the aforementioned times, the value of DASH can increase by 10% in one hour then decrease by the same percentage in the next. Therefore, no one knows – including expert traders and all-star investor legends – where cryptocurrency prices are going in the short to mid terms. However, what we know is, that Dash will be with us for a long time. As the privacy-focused coin becomes more and more popular, its price will likely increase in the long-term. What is the best way to buy Dash? The best way to buy Dash determines on your goals and preferences. Do you prefer speed and convenience? Or you are after maximizing cost-efficiency? Maybe you seek to buy Dash while staying as anonymous as possible? These are the three most popular options, and here were are with the best solution for each. Let’s see them. In case you want your transaction to be quick and convenient, credit card payments seem like the best option for you. In most cases, you can cut out the deposit process from all that as a large percentage of service providers almost instantly credit your account with Dash (after the payment has been completed). On the flip side, credit card transactions usually cost more than other payment methods like bank transfers. However, this varies by service provider, some charge no fee for credit and debit card transfers, while others have processing fees up to 10%. If cost-efficiency is your first priority, then we recommend you to use bank transfers to buy Dash, especially if you are located in the EU with access to low-cost SEPA transactions. While this payment method is one of the cheapest ways to buy DASH, it is not so time-efficient. While most bank transfers take a few working days to process, in case of international wires, these transactions can take over a week. Furthermore, if you are using bank transfers to buy Dash, you can’t cut out the deposit process. We can understand that a part of users seek to stay anonymous when they are purchasing a coin. However, that can sometimes become hard due to the strict regulations most service providers are facing. Therefore, they are requesting different documents from you before you can buy a coin. So, to stay anonymous when you are buying DASH, you need to use a service that has high initial account limits (like Binance and Changelly). Another method is to use a local solution, such as Dash ATMs or sellers of the privacy-focused coin in your area. No, Dash is certainly not a scam. The cryptocurrency has a solid team behind that is continuously improving the network. Also, many investors and traders have made profits by either buying and holding the coin or by trading it. Should I invest in Dash? That’s a question you need to answer yourself. Do you have the necessary financial background that would allow you to invest in Dash? Did you do a thorough background check on the coin? If yes, did you find the coin a solid investment? If you answered all these questions yes, then you may go for investing in Dash. 5 How to trade Dash? 8 How to sell Dash? Is dash a fork of bitcoin or not ? Can someone guess what will happen with Dash in 2020? I am expecting 2017 to repeat itself! It was the best year for Dash (and me)!